Srinagar, September 2 (KNO) : Dr. S.P. Vaid, DGP J&K, met Governor Satya Pal Malik at the Raj Bhvan here today. 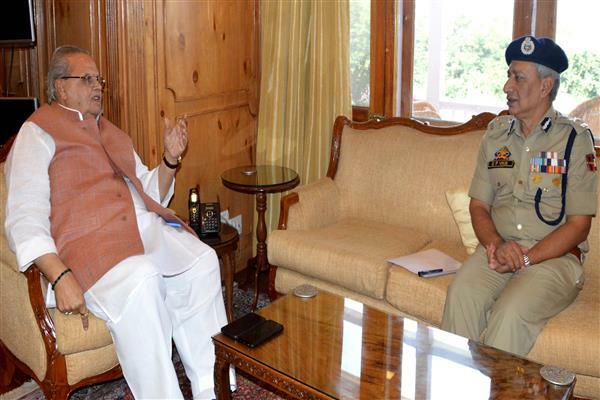 DGP briefed Governor about the internal security situation in the State and about various welfare schemes of the J&K Police instituted for its personnel. He also apprised Governor about the role and responsibilities of the J&K police in the annual conduct of Shri Amarnathji Yatra. During discussions with the DGP, Governor emphasized the vital importance of public order being maintained, as a first step towards securing peace and normalcy in the state and stressed that all Security Forces must act with complete synergy to achieve effective security on the ground.